Dukuri 30 tooth Swivel Thinning Shears. 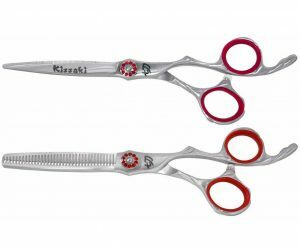 This is the Dukuri 6.0″ – 30 tooth Swivel Hair Thinning Shears with the secure flat key tension adjustment system. The thumb swivels a full range of 360 degree motion and is great hair scissors for reducing and preventing Carpal Tunnel Syndrome and painful cutters cramp. These Dukuri 30 tooth Swivel Thinning Shears are made from the Highest Quality Forged Japanese Hitachi SUS 440C Stainless Steel (Rockwell Hardness of 60+) with an elegant and durable brushed satin finish.